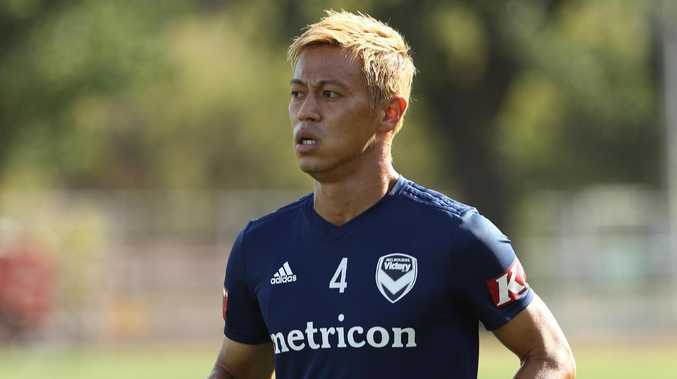 MELBOURNE Victory superstar Keisuke Honda will be given every chance to be available for Sunday's top-of-the-table clash with Perth Glory, as coach Kevin Muscat faces some big selection calls. Niggling injuries, availability and management considerations have Muscat weighing up a host of first XI scenarios, with Carl Valeri, Storm Roux, Georg Niedermeier and James Donachie all to be assessed this week. The AAMI Park clash looms as the match of the season, and a crucial one in deciding the Premier's Plate, with Glory sitting four points ahead of Glory. Glory announced themselves in Round 2 with a 3-2 upset of Victory at AAMI Park, and Tony Popovic's side has lost just once since. 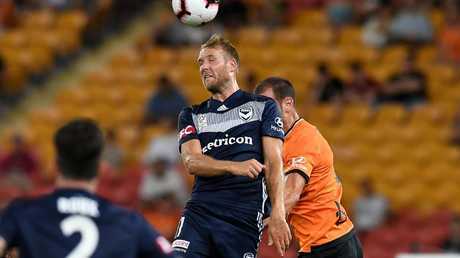 Star Victory striker Ola Toivonen, who was absent back then, will return to the first XI after soreness saw him remain as an unused sub in the stunning 3-2 comeback win over Central Coast Mariners. Honda, who did some intensive training last week including shooting and explosive work, will have his training regime ramped up this week and will join the main group at some stage. 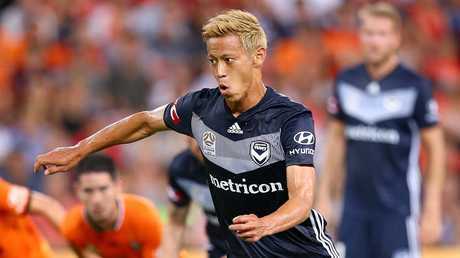 The Japanese star has scored five goals and assisted three times, despite not featuring since the December 14 win away to Brisbane Roar. He would start on the bench if passed fit. Leigh Broxham's versatility will be vital - stopper, right-back and defensive or right midfield all possibilities for Victory's Mr Fixit as Muscat and assistant coach Carlos Perez Salvachua analyse their options against a Glory side featuring Spanish whiz Diego Castro and Socceroos Asian Cup star Chris Ikonomidis. Valeri is awaiting scan results after limping off just before half-time against the Mariners. Roux (soreness) should be available this week and Victory will be eager to get Terry Antonis into midfield, after his admirable performance at right-back in place of Roux. Valeri's absence would most likely see Baena or Broxham play in his anchor role, although teenager Anthony Lesiotis was solid in his longest run, replacing Valeri in the 44th minute. If Roux is unavailable, Broxham looms as the shrewdest right-back option, although Muscat and the medical staff will need to be confident that Niedermeier or Donachie could get through a full game to start alongside stopper Tommy Deng. German Neidermeier came on in the 85th minute of the Mariners win, having not played a full game since November 25. Donachie, who only returned from a stint at Jeonnam Dragons last week after a virtual swap for Nick Ansell, hasn't played since December 1 - the last game of the South Korean season.